Last week, we went skiing with a group of collegues from Finalist. The week was very nice, apart from a few broken ribs, a pair of sunglasses that were lost and a pair of skis that where stolen. Pictures can be found on my gallery. This week is the Dutch Design Week 2007 in Eindhoven, the Netherlands. Throughout the entire city are exhibitions and lectures on topics related to art and design. The most interesting locations during this week are Strijp S, an industrial complex consisting of former Philips factories and now transformed into a center for artists and cultural activities, the Witte Dame, also a former Philips factory and currently the home of the Design Academy and the campus of the Eindhoven University of Technology. Last Tuesday, I visited the Dutch Design Week with some Industrial Design students which I happen to know. I think it is very inspiring to see the idea’s of other people with regard to design and art. Strijp S was the most intersting in my opinion, but the graduation gallery of the Design Academy also had some inspiring ideas. We also visited Little Mountain. This is a creative environment for starting design companies (mostly individual designers). The interesting part of this, is that it is a commercial company providing low-cost facilities for young designers. The people which have their office here, do not only pay rent, but also has to commit four hours a week on projects in which all companies in the building participate. Obviously, I made some pictures of the various exhibitions, which can be found in the gallery. Update: Additional photographs can be found at my new gallery. Yesterday there was an event at Eindhoven, called TU/e Fast. 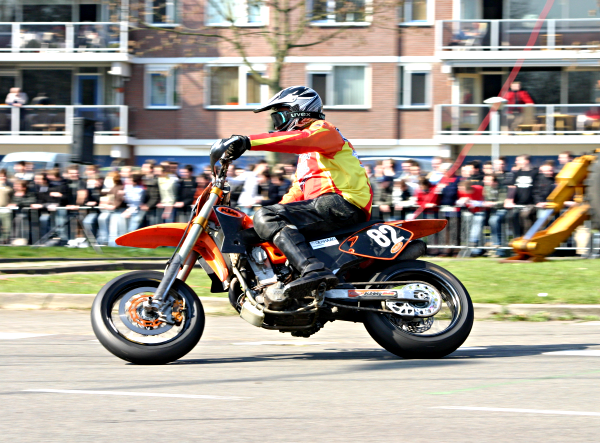 This event consists of demonstrations of several fast vehicles, such as motorbikes, drag race cars and rally cars. It was organised by the European Week Eindhoven committee. My girlfriend is chief editor of the newsletter which is published every day during the European Week Eindhoven (which is this week). So, I was allowed to take photo’s from positions where regular public was not allowed. Unfortunately, I do not have a very fast camera nor a very good lens. I’ve used my Canon EOS 300D (Digital Rebel) with an Sigma 70-300mm F4-5.6 APO. I think I took some nice pictures, but I’ve already seen better pictures from others. Oh, well… I’m still learning I guess. Below I have a photo of a supermoto bike and a Lamborghini Gallardo. More pictures can be found in this TU/e Fast set on Flickr. I have lots of more pictures, which I will upload soon (at least a selection of it). For people who think the only solution to have decent photo editing software, is to use a pirated version of Adobe Photoshop or Painshop Pro, there is a site called ‘Open Source Photography’. The site is all about (digital) photography and processing photographs using open source software. It contains tutorials on The Gimp, Illustrator and other software and provides information on other tools. The site focus on users, and I think this kind of initiatives makes open source software more accessible to common people. Today, I fixed the images on my weblog of past articles. Because I moved my weblog to another subdomain, all links to pictures were invalid, resulting in no pictures at all on my weblog. Now, I simple created a symlink from the old location of my pictures to the new one, and that seems to work. While doing this, I also discouvered that it was possible to brows the directories on my webserver, which is a small security issue. Obviously, I fixed that as well. 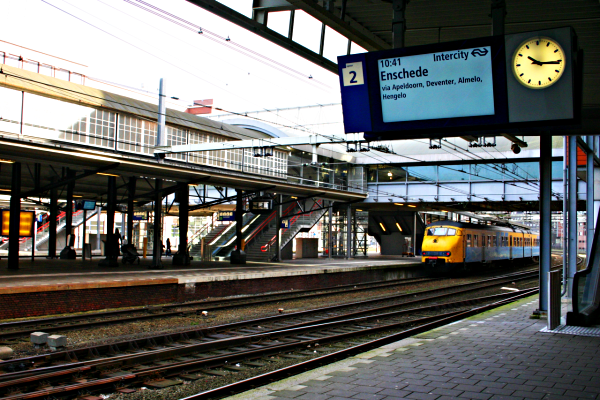 Last Saturday, I had to go to Amersfoort. Because I was a little earlier than planned, I took the opportunity to take some pictures (it was very nice weather). Below is a picture of the railway station, where one of the electronic notice boards can be seen. The NS is experimenting with these boards in order to replace the old-fashioned signs that are currently used on most railway stations. I think it is an improvement on readability. I did also some cleaning of the code, because various parts were using different dabase classes for example. Some parts of the code are still really bad, but that will be cleaned up eventually. For my personal site, I did some investigation on a photogallery script. I have a pretty big number of photos, and I’m planning to share them with the world for quite some time. In the past I used a custom script for this, but due to a server crash, I lost most of that script (and it wasn’t very stable as well). Because I don’t have the time (and I don’t want to) to write a new script, I decided to use an existing script. While there are many packages for webgalleries, it seems most of them are broken in some way. I looked at Gallery, which is too bloated (and not easily to customize I think), PhpWebGallery is also too bloated (and hard to customize). PhotoStack looks nice, but is a little to simplistic (upload features are limited, and no comments), Plogger also looks nice, But I decided to take a more indepth look at Zenphoto. This package seems to provide exactly the features I’m looking for in a nice way. The default themes are also nice and clean (which is not the case with Plogger). Today we visit Strijp S, the former factory buildings of Philips which are now converted into creative studio’s and housing for designers and art artists. This week the Dutch Design Week is taking place in Eindhoven. The yearly event is becoming more and more important for designers in Europe. In the entire city there are expositions and lectures about design and modern art. More pictures of Strijp S at my Flickr photostream. Today I fixed a power supply of a LaCie USB-harddisk. The connector from the adapter to the harddisk was broken. On the photo is a so-called ‘third hand’ visible. The power supply is now working again, total costs: 3 euro. (I ruined one connector when soldering). A new power supply costs > 30 euro. Last weekend there was the FIRST LEGO League Open European Championship at the university in Eindhoven. I visited it both Saturday and Sunday where I took some pictures with my new Sigma 70-300 APO lens. I didn’t have the time yet to filter the pictures and put them on the internet, but I will do that soon. It was very nice to see how smart some children are. The idea is that the teams build a robot using Lego Mindstorm to solve some ‘problems’. The battles were intersting and it was nice to see something like this for a change. I also finished the redesign of the website of ESBV Panache. The site is pretty simple, but has to be available in both English and Dutch. Canon today introduced a large number of new products. The first is the Ixus 800 IS, which is the first Canon Ixus camera with build in image stabilization. The Ixus 60 and 65 are also new, with a large 2,5″ LCD-camera. Also the Powershot A-serie is extended with new models. The A700 and the A540 are the more expensive models, the A420, A430 and A530 are aimed at the budget market. For the prosumer market there is the new PowerShot S3 IS, which has an 12x optical zoomrange and build-in image stabilization. Finally there is a new dSLR from Canon which is the EOS 30D. This camera replaces the 20D which is positioned above the entry-level dSLR EOS 350D. The new features of the 30D are limited, but interesting enough to choose the newer 30D above the 20D. Canon also introduces two new lenses for the Canon EF-mount, a 85mm F/1.2 L-lens and a 17-55mm F/2.8 lens with image stabilization. This last lens is intersting, but unfortunately a little bit expensive with an introduction price of more than 1100 dollar. You are currently browsing the archives for the Digital Photography category.